Um sorry, it's been far too long since my last post. 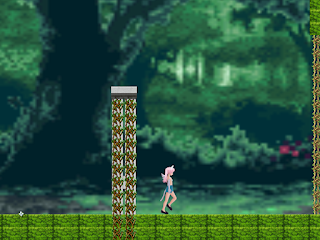 This is something like a small tech-demo to show what platforming in sakurahime could be like. I've actually made most of this before I've even started sakurahime(as a small part of a different game). Note though, the platforming in this game is quite a bit buggy(I made most of this before I knew about things such as mask or other things related to collision), these bugs are already fixed in sakurahime though. So this is sort of just to give you an idea of what the platforming in sakurahime will be like. The name of the demo is Magical Girl Pink, it's a very short demo with h-elements in it. Um, I also have a demo of something else I can post but I think I'll wait to post it for now. Um, please feel free to let me know what you think of the demo(I enjoy reading your comments...).